Women’s bodies are under a lot of scrutiny at the moment. Well, when are they ever not? But as feminism splinters into many – what almost feel like competing – factions the representation of women’s bodies feels an ever more complex and conflicted issue to navigate. After over 50 years of acculturation into a media-led, ‘male gaze’, ‘woman-as-sexual-object-used-to-sell-something’ culture, there are those who want to run away screaming at the sight of female flesh. At another point within the feminist matrix, there are those reclaiming women’s bodies and female sexuality and owning them: let us represent ourselves as sexual beings if we so choose. Meanwhile the representation and celebration of the bodies of our trans and non-binary sisters is another strand in the rich tapestry of this debate. And of course age comes into the mix – the hyper-sexualisation of young women by the media butting heads with the concept of young women becoming sexual beings, which so many men find so challenging. Take all of these, what shall we call them, competing ideologies into the arena of circus and other patterns emerge. The ‘old’ tropes of scantily clad showgirls, or passive ‘assistants’ has moved on but having one token female performer, generally a bendy young aerialist, within a company alongside five or six men is boringly commonplace. 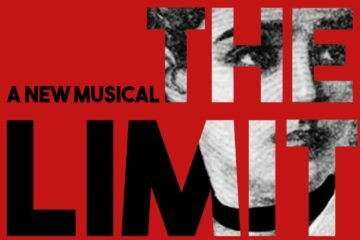 All of these thoughts are running through my head as I rehearse my feminist circus-musical adaptation of The Little Mermaid (a mess of misogyny in Hans Christian Andersen’s original, and not much improved, from a feminist perspective, by the Disney animation). Originally conceived for six female performers (the Mermaid Sisters) and one male (The Prince) to directly subvert the typical gender balance in circus shows, that original casting breakdown has now evolved along with the gender politics of the piece. When we began developing the work in 2016 I was interested in inverting and subverting the classic gender tropes both of circus and of the original story. I wanted a headstrong and physically strong Little Mermaid longing to escape her feminine world underwater and a passive and ‘feminine’ Prince feeling trapped in his masculine and macho world on land. But as the piece evolved it began to feel increasingly old fashioned and slightly problematic to be clinging to the very concept of gender binaries – even if it was in the name of subverting them. And so the distinction between the two realities (and ideologies) of sea and land became the distinction between a fluid place where identity is self-defined and the rigidity of the land (loosely set in the 1950s) where gender roles and binaries are strictly observed. To be ‘mer’ then in this world is not to be feminine nor to be female, in fact it is to be beyond gender. How much of this will resonate with audiences at least half of whom will be young people remains to be seen, not least when we are telling our story through circus and song! But it feels an exciting time to be presenting bodies in so bold a way. For a young boy to see himself reflected in a Prince full of emotions he cannot express, stifled by a society that frowns upon the expression of male emotion. For audiences of any gender (or those who don’t subscribe to the concept of gender), it’s important for them to see themselves reflected in characters that are flawed, are human (even if they’re Mer) but are redeemed by love. At its essence Little Mermaid is a love story. For Disney fans it’s a happy-ever-after love story (albeit one where the woman makes all the sacrifices … hmm). Even in the original Hans Christian Andersen version it’s just a love story ending badly – that is being turned into sea foam, which is a pretty bad end all things considered. In our version love – in all its forms – triumphs, and the sacrifices in getting there are shared equally. Circus is often a great vehicle for narratives of hope and redemption – perhaps because as bodies leap and contort, as the clubs are thrown higher than seems catchable, we the audience must join the performers in hope, in an act of faith. There is a will to succeed that unites both performers and audience more than any other live artform. That’s part of what makes circus such an accessible art form and as The Greatest Showman demonstrates, what makes it a celebration of humanity. Indeed right back at the birth of the Circus ring, 250 years ago this year, it was a place of great freedom for women. Before female circus tropes became sexualised there were far more empowering tropes – literal strong women and female acrobats able, indeed compelled, to reject the restrictive dress of their contemporaries in order that they could fly. Their corsetry and the full skirts of Victorian England literally stopped them flying. Not a metaphor. 2018 brings an outpouring of circus from companies both established and emergent, all celebrating the 250 year anniversary of Philip Astley’s circus ring – so keep your eyes peeled for a rich array of female-led work. Alongside our Little Mermaid there’s Mimbre with their new production The Exploded Circus, touring from May. 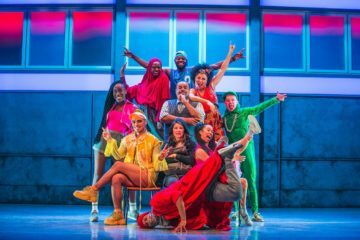 A narrative piece played out in a suspended moment of time, mid-explosion, six women emerge from the rubble of the big top and have to forge a new society. Vicki Amadume’s Upswing are touring their Ramshackle House again and watch out for all female Cyr wheel trio Alula, and Aislin Mulligan’s company Circumference. 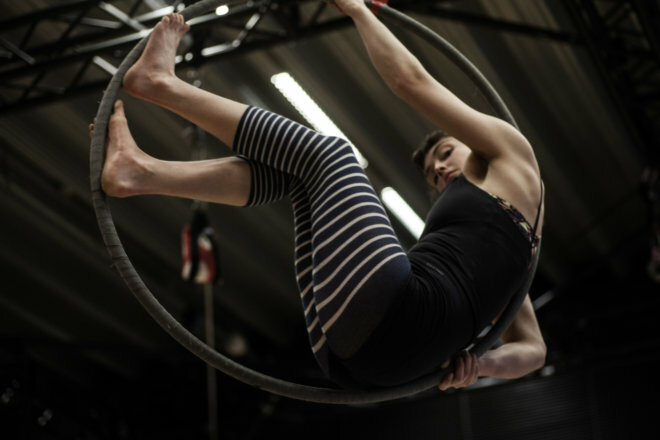 Women in circus are having a moment – putting women’s bodies in the spotlight for all the right reasons. Watch them fly. Both images are courtesy of Metta Theatre and are rehearsal shots from Little Mermaid. Image one is of a performer curled up in an aerial hoop. She looks down at the camera from underneath her arm. She wears stripy tights, black shorts and vest and has bare feed and arms. Image two is of a performer standing on the heads of two others. All three face to the right, with only the torsos and heads of the basing performers visible in the image. Both bases wear brightly coloured swimming caps. The figure balancing on them has one foot on each head and has her arms held out to balance herself. A few other people are just visible at the bottom of the shot standing around them. Lissy Lovett, The F-Word’s comedy and theatre editor, is executive director of Mimbre where Poppy Burton-Morgan is a trustee.